Toenail fungus is absolutely ugly, nasty and embarrassing, the fungus gets under the nail and thrives in dark, wet places making foot fungi one of the most difficult to treat and cure. In this article we are going to explore how to cure toenail fungus and the variety of options available to help you remove your toenail fungus and most importantly show you what to do to prevent it from returning. Foot fungus can and will spread quickly to the other toes if not treated properly, to help prevent this you should cut the infected nail down as low as possible. 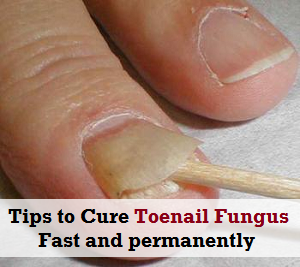 Removing the nail or cutting it short will not completely cure the fungus however it will help prevent it from spreading to the other toes, it also provides room for the new nail to grow and when it does you should let it grow. For hundreds of year's vinegar has been used to treat infections and a variety of other medical issues. Soaking your feet in vinegar after you have cut the nails back is a good way to help reduce your toenail fungus. Vinegar is good when the infection in its mild stages, it is not as effective if the infection is heavier. From a variety of reports online many people say that soaking your feet in Listerine mouth wash can help lesson your foot fungus. Keep in mind that when you soak you feet in any solution it should be for at least 30 minutes a day, for several weeks for it to have any effect. Foot fungus thrives in public showers and bathrooms, whenever possible you should always make sure you wear appropriate foot ware when using public facilities like these. Many people often sleep with their socks on, this is not a good idea as when you are sleeping your feet will sweat. Socks that can be a breeding ground for bacteria, combined with sweaty feet for hours on end is a perfect environment for foot fungus to breed. If you have a heavy infection of foot fungus, these home remedies may not be that effective enough. Toe and foot fungus lives under the nail and is quiet stubborn.